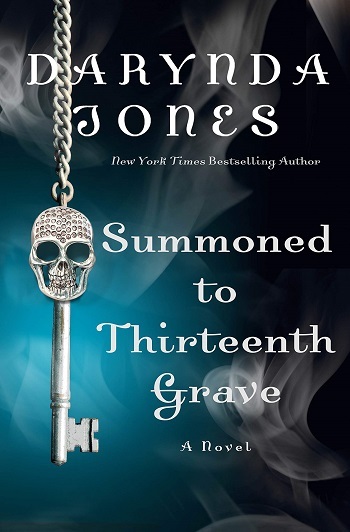 Grim Reaper Charley Davidson is back in the final installment of Darynda Jones’ New York Times bestselling paranormal series—Summoned to Thirteenth Grave. I can’t quite believe this is the end. I think the series is ready to end but I’m not sure I’m ready to say goodbye. As a final story, this is one of the most exciting in the series. The farewells in this book made me cry but a few of the twists really didn’t sit well with me. I like the slightly ambiguous ending – though it might have been a bit more clear if I hadn’t blubbered through the last twenty pages. Charley and Reyes finally feel like grownups in this book and they finally feel like a solid partnership. And there’s even a couple of scenes where they actually feel like parents. It probably shouldn’t have taken thirteen books to get to this point, but they are good together here. The goodbyes to the rest of the characters are a little bit easier because of all the prophecies about Beep and her army. I may have cried with each goodbye but I’m still holding out for Beep’s spinoff series. The supernatural elements of this series have been getting stranger and stranger with each book. This time, I feel like things are a bit simpler. Charley and Reyes have to stop the demons who are taking over their city. Demons that Reyes created and Charley let loose when she freed Reyes from the god glass. There are still a few too many WTF moments that I refuse to analyse too closely, but this is a more streamlined story than the last few books. There are a few elements of this story that still don’t sit well with me. But after binge reading the series over a couple of months, I will admit that I’m probably way too invested in this series and these characters. Charley’s banishment is a complete disappointment. It feels like a repeat of Reyes’ God Glass excursion in the previous book and aside from providing Charley with material for new jokes, it doesn’t add much to the series storyline. Just as disappointing are the revelations about Uncle Bob in this story. We learn things about him in this book that contradict everything we’ve know about him from the start of the series. So, I have a few reservations about this final book but I still found it difficult to say goodbye to Charley and her allies. This feels more coherent and more carefully constructed than some of the most recent books in the series. I’ve enjoyed these characters and after thirteen books I’m still enjoying the author’s fresh take on Urban Fantasy writing. I can’t wait to read what Darynda Jones writes next. I'm super sad that this is the last book in the series. I have grown to love the gang and Charley’s wisecracking ways. I will truly miss them. I think Summoned to the Thirteenth Grave has finished the series perfectly. Of course in the series there is always a secret or two that needs revealed, and since Charley is a multitasker, she deals with all this while trying to save the world. For me, I felt this book was an emotional rollercoaster, maybe because I was preparing myself to say goodbye to a bunch of characters I truly love. I just loved this book, just as much as I have loved the rest of the series. It's always bittersweet to reach the end of a beloved series, it's difficult to say goodbye to characters that you've come to love. As the saying goes, all good things must come to an end! Book #13 (fitting!) in the Charley Davidson series was the perfect conclusion to an imperfect series. While many questions were answered and surprises revealed, there were also little things that weren't fully resolved. I can only hope for a spin-off, as I need to see what happens with Beep in the future. I found myself very emotional throughout the book: laughing at the interactions, crying at times, floored at others, nervous about the outcome, and truly upset this is over. I don't want to say goodbye to everyone, but it's time for the story to end. I was satisfied with the ending, but always want more! This is the thirteenth and (sob sob) final book in the series. I have read them all over the last couple of months and have no doubt that they will join my series-to-be-reread list, because sometimes rereading after knowing the ending can make subtle points clearer... not that Charley is renowned for subtle, to be fair! I cannot spoil the story, so really just want to reassure the ardent fan that this most definitely needs reading, and the newcomer should scoot straight off and start at the beginning, or be endlessly confused (and miss out!). It was great to see how each character had developed and become someone of importance to the team and to us – and yes, there are a few punches still to be pulled, so be ready! There are both earthly and supernatural events for Charley and Co. to engage with, and her humour is somewhat tested as she has to stop some even more bad things from happening. I kind of hope that there are spin-offs from this series, as I have hugely enjoyed the crazy – and all the chapter sayings – but at the same time, I will be happy with Darynda Jones bringing a whole new world to light. Reviewers on the Wicked Reads Review Team were provided a free copy of Summoned to Thirteenth Grave (Charley Davidson #13) by Darynda Jones to read and review.